I was in a house recently that was on the market. It had just had major renovations, was staged beautifully and was priced well over $600K. I stuck my head in one of the many bathrooms and chuckled. In spite of its many modern features, the toilet gave away the age of the home, which was built in the early 80’s. What gave it away was the size of the tank…huge. A few years ago when the conservation of water became an issue…I mean why use 5 or 6 gallons of highly treated water to flush stuff away when a lot less will do? Most toilets, old and new, work pretty much the same way but a little thoughtful engineering has made a lot less water necessary. In fact, when you put a brick or two in an old tank, you learn that even using less water will clear all but the most extreme situations. Anyway, a few years ago it became the law that new toilets being manufactured could use no more than 1.6 gallons per flush. This saves enough water in a busy household to significantly impact the water bill in a positive way. To encourage replacing older less efficient toilets with the new ones, the City of Durham started several years ago to rebate $100 on your water bill for each old toilet you replace. More information on that can be found here. Another water saving feature that is relatively new in this country is the “dual flush” toilet. That doesn’t mean you have to flush it twice but that you have two ways to flush it. One way uses about a gallon, which will easily clear most waste. The other way is when you just need a little more clearing power. Two other trends in toilets are notable especially if you are updating things in your home in anticipation of selling it someday. One is the popularity of the so called “chair height” toilet. Most folks now also opt for an oval or elongated bowl rather than a round one. If you are young and small, neither of these things will make much difference to you. However, if you are “big and tall” you will find the extra height a lot easier to get up from. Add old knees and you might be able to delay installing a grab bar for a few years. A good toilet will cost you $100 to $200. Installing a toilet will cost you something but a professional handyman or just a handy person can do it. There’s nothing terribly complicated about it but the suckers are heavy, and a lot of water can slosh around. Personally, I think one of the merit badges that you should have to earn to become an Eagle Scout should be toilet repair. Every man and independent woman should be able to change the flapper and fill valve and reset or install the whole toilet. How-to videos are easy to find. One thing that can make toilet replacement difficult is matching some of the old colors. 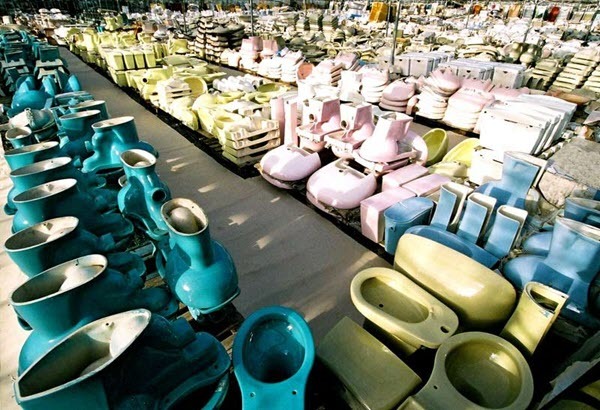 Finding a modern toilet to match a 60’s turquoise, or yellow or, lord help us, pink, might be very difficult and/or expensive even with a rebate on your Ordinary Durham water bill. White or off-white are the most popular colors because if you deviate from them they get very expensive.